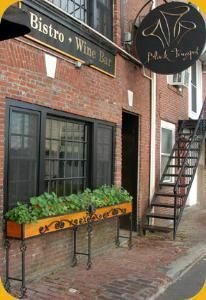 Black Trumpet is a two-story bistro and wine bar in the heart of Portsmouth’s historic old port, offering views of the Piscataqua River. The building that houses Black Trumpet claims historical significance for two reasons. Signatures on the hand-hewn beams in the wine bar from the early 19th century reveal the space’s original occupant, a ship’s chandlery that sold wares to the many colonial ships using the harbor. On a more contemporary historical note, the address 29 Ceres has hosted two of the most distinguished dining destinations the Seacoast area has ever seen: Blue Strawbery (1970-1996), and Lindbergh’s Crossing (1996-2007). Our dining room offers a private setting with warm, professional and unassuming service. The menu capitalizes on the freshest seasonal ingredients. The wine list features a variety of unheralded gems that pair well with the bold flavors of Chef Mallett’s cuisine. Black Trumpet’s cuisine reflects the chef-owner’s culinary curiosity, drawing inspiration from the Mediterranean as well as the Americas. The Black Trumpet dining room is available for social or corporate events seating up to 35 people. The historic character and beauty of the room, along with unparalleled food and service, makes a truly memorable evening. Rehearsal dinners, small wedding dinners, family gatherings, holiday parties, and social or working business dinners all work extremely well at Black Trumpet.